Description: Cap 1 to 7 cm, broadly convex, becoming nearly flat, often with a central depression, even or inrolled margin, nearly bald or finely hairy-scaly, deep purple fading to brown; gills attached to the stem or mildly decurrent, widely spaced, thick and sometimes appearing waxy, dark purple, fading to lilac; stem 1.5 to 12 cm long, 0.5 to 1.5 cm thick, equal or slightly swollen at the base, strongly grooved and sometimes twisted, usually coarsely hairy or scaly, purplish or paler, with purple to lilac basal mycelium; smell and taste mild; spore print white. Habitat: Scattered to gregarious on ground in coniferous forests, fall. Primary keys: Purple cap and gills fading to brown; indentated cap; shaggy and grooved purple stem. Edibility: Good. Not much flavor, but delightfully crispy/crunchy. Only the cap is used, since the stem is too tough to eat. Notes: The long, tough, hairy, purple-streaked stem, waxy/crisp purple cap and gills with cap indentation make this an easy mushroom to identify. 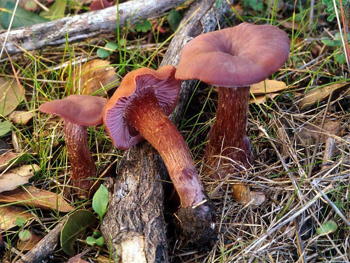 Young specimens are dark purple but quickly fade to light brown with age and rain. Simmer together broth, ginger slices, soy sauce, sesame oil, sugar and wine for 15-30 minutes. Remove ginger slices and keep warm. Thoroughly combine pork, minced green onion, ginger, mushrooms, soy sauce, sesame oil, wine, salt and pepper in a mixing bowl. Shape into 1″ meatballs and roll in cornstarch. Fry batches in oil loosely in large skillet over medium-high heat, turning frequently until evenly browned. Remove and drain. Add meatballs, water chestnuts, carrots, peas and corn to the broth. Bring to a very low simmer for 15 minutes. Ladle into serving bowl and top with slivered green onions.